Wireless fiber is the answer,no cables at all,that maybe light years away.just how much cable is there strung on electric poles and who knows which ones are in use,but for some it's not which connection to choose,as there not all available to everybody. if your lucky enough to be where the connections are. the more cables added will make a bigger problem when they have one. If anyone is considering a change \ upgrade it is worth looking at SINET. We have been with them 4 years now. 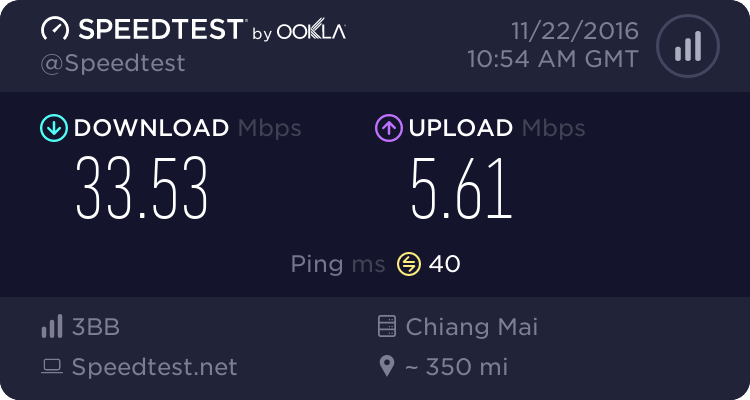 We have an agreement where when we go overseas, they Switch Off the Internet, They DO NO charge us, and Switch it back on when we arrive back in Thailand ( be that 1 month or 6 month no problem ) all with NO charges. I must be one of TOT's very last customers. Since a week my TOT internet was hardly working at all. So I had already changed to a temporary 3G package by AIS over my mobile phone, planning to get connected to the fiber optics cable by 3BB that's running by my house. Today TOT mechanics showed up to check my connection without being asked, presumably feeling the need to keep me customer. I let them move the cable to a new room I'm using as office now. Later my connection worked fine again, showing around 8 Mbps on the speed tests. So since September 2016 2 outages lasting about 20 minutes each time. My TOT landline and ADSL internet is dead again since last Friday. The modem is logged in, but shows a red light for "no internet connection". Did a dog leak against one of their poles and caused a short? Took them 5 days to fix; now it's crawling at the 6Mbps again. The phone line is still dead. But I don't use that anyway. I haven't posted about my 3bb connection as i didn't want to speak too soon, as they say. since September 08, 2016 going strong. A LABRADOR received an electric shock when it cocked its leg on a lamp post. West Virginia and second one New York DL, third, New York UL. Try TestMy.net, forget all the other b/s sites. 3bb touch wood, not a drop in the service yet, the speed has now been increased to 50 m/b d/load for the same price, 590 + vat. TOT will have to go some now to beat that. what is the reconnection charge in the event that you get disconnected,do you know. My TOT adsl keeps working, just more bad than good. Sometimes it cannot be used at all, resets the connection every few seconds. Then I help myself with tethering over the mobile phone, either USB tethering or Wi-Wi hotspot. I get a steady and stable data connection over my 1-2-call, 512kps for 89 Baht for seven days by dialling *777*7009#. TOT has been down here all day, not just for me but a wide area has no telephone connection, 3BB is still up since it's been connected 3 weeks ago, speed is still almost 23 down. 1 up for3BB so far. Could be the rain. My True was down for one day although the, "online" light was still on, on my router. I called True and they told me several people had this problem. I no longer have the Red Dish either for my True Visions. Everything is all hard wired in now. So according to the article in the dailynews.co.th. that people seem to be unaware of, your ISP cannot charge you a penalty if you sign up for 12 months and then cancel it. online lawyer tanaiwirat.com. stated you have to give 5 days notice, that's all. you can also make a claim if your connection is down which must be paid to you within 30 days. They come today to connect up, no telephone, just turned up, unlike the tot connection which has an outside earth and a box screwed to the wall, they put the cable straight through the centre of the roof and down to which room you want the modem in. A month gone by and several phone calls to their office, no joy, just the same old. Wait! Wait!. Now we are told the electricity people are having a gripe about where they have put the cables up on the pylons. Having a look you can see the cable's are touching each other. I forwarded this mail to the related team for solving your problem. 1100 for informing. Or you wife can complain such problem through this website in Thai at http://tel1177.tot.co.th. The line 0449740** has been down for many months now. Asking the operator on 1100 to send a technician has been steadily ignored by you. Is there a way to send a technician to have the line 0449740** fixed, and your server adjusted to supplying a usable internet connection? If not, please don't hesitate to tell me, so I can give up hoping and move to another ISP. I would interpret this answer by Khun S. as the advice, not to waste anymore time on TOT. Your local internet service provider probably doesn’t have the fastest DNS servers, and that can slow down your browsing, since your browser needs to look up the IP address of every web site you try to view. Here is how to switch to either OpenDNS or Google DNS for faster browsing times. The internet has been messed up in my area too. I changed channels on my router, which seemed to help. I use true cable. AIS has been sniffing around my hood now trying to market their internet service, but they all use the same pipeline. My TOT internet connection is ADSL, where the signal comes over the phone line. The only channels to change there were the Wi-Fi spread in your house. I don't have a problem with that, can connect to the modem by cable with the same results. The problem neither lies in the phone line, but as I understand in the server of the exchange or TOT's main server. They neither keep their hardware up to date, nor are they extending capacities to the increasing demand. From last Friday after a short but heavy downpour until yesterday TOT line was totally down here, in the neighbour village a car seems to have rammed the pole, and all the cables were hanging down, some torn and disconnected. But since a few months already it can hardly be used anymore, resets very often and doesn't find it's way to a server connection again; the server seems to be far overloaded. And if it got an internet connection again, it is most of the time hardly faster than 50 Kbps. The 6 Mbps sometimes, but very rarely come in from about 3 to 6 am, not a time I hang in front of the PC. So I got used to keep an "alternate connection" to the web over my 1-2-Call mobile phone set to Personal Hotspot. The code *777*740*316358# gives me a weekly package of 512 Bbps, far better and reliable than TOT with their most of the time not working 6 Mbps. I keep thinking about 3BB, too, since they advertised on the poles in the village on the main road *(Hwy 205) about 5 km from here a bout two years ago. Though I don't know whether they're up here, yet. 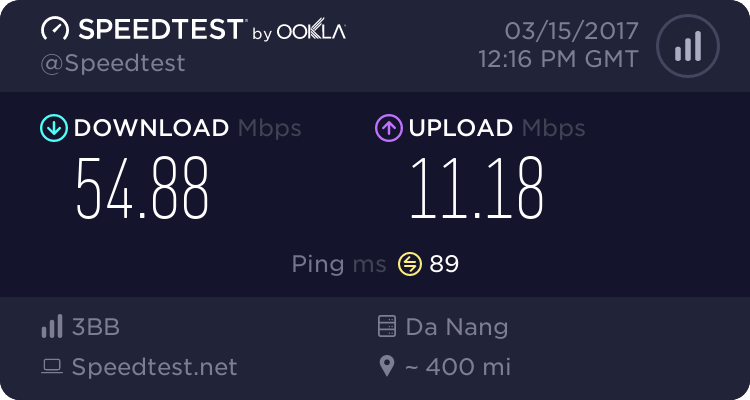 About 3 months ago my friend Detlef in Khok Sung (a little closer to town on Hwy 205), a 100m neighbour to O&D Pub & Restaurant, postet on Korat-Info about his new "Sinet" internet: fibre optics with 50 Mbps down/20 Mbps up, initial cost 1.750 THB incl. 500m cable. After a year they want to reimburse 1.000 THB of that. Monthly cost 699 THB + 7% VAT. Of course tot was down for everyone, for about 24hrs,right the way from BKK to Korat and on further. They had a main cable brake, so i heard. 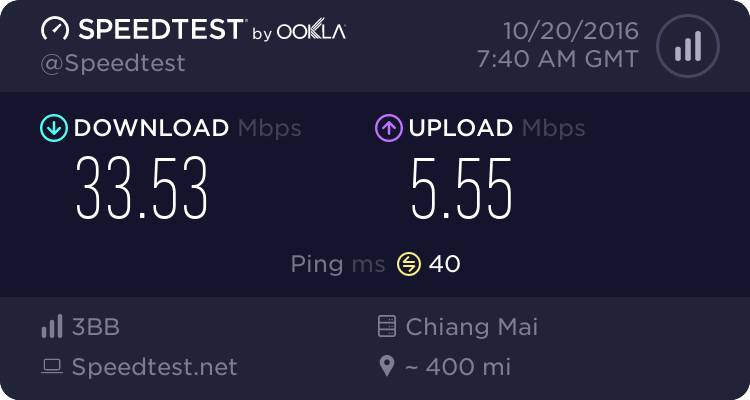 About 6 months ago i asked tot for a faster connection than my 6 meg, too far from the exchange box i was told, 2 kilometer the speed drops, if we increase the power the connection will keep cutting off. Put another exchange box in i said, Too expensive, we would need at least 9 or 10 customers to do that. So we found 9 people who wanted a line put in around where i live, took the list into tot heard nothing since, that's 6 months ago. So about a month ago we went into bb with the list of the 9 names we had, bb were out in 2 weeks surveyed the area and visited all the names on the list, they've since been back for the installation fee and said some time this month you'll get connected. yesterday they were out running up the lecci poles putting the cable in. BB runs on VDSL modem. The price 2,100 bht which includes the installation fee and returnable deposit of 1,500 for the modem. contract 1 yr. 20 down speed 590bht + tax. 50 down 700bht + tax. 100 down 1,200bht. per month.